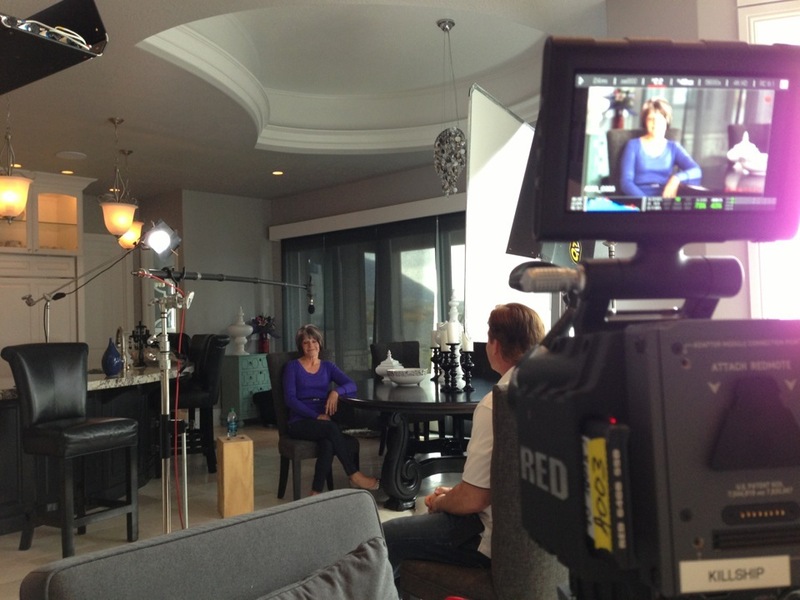 Last week I was hired to shoot some testimonials for an infomercial. We shot 13 people at a couple of beautiful homes over two days. We shot on the Red Scarlet with Zeiss high-speed primes (f/1.4). I had plenty of light in the lighting package but ended up using hardly anything for these setups. I’m still baffled by what we got and how we got it. The shots were gorgeous and high key; but because of the native 800ISO of the Scarlet, the high speed of the glass, the desire to have soft backgrounds, and the lack of ND filters, I needed to use so little light that it was almost disturbing. The houses we shot in had these wonderful huge windows that were thankfully equipped with powered shades that cut the light down a lot. We ended up closing all the shades and using a single tube of a 4×4 KinoFlo through a 4×4 frame of 250 diffusion for key. Then for fill, we bounced a 4×4 Kino into the ceiling or wall. For a hair light, we had a 300W fresnel with full CTB and one to two double scrims (depending on the subjects hair color) to knock the power down even more. That’s it! One tube of a Kino through a 4×4 frame of 250 diffusion. What?! Essentially the same setup but I did have the help of a half-open window for key. Also, there is a 1K spotted on the flowers and vase in the background from outside to liven it up a bit. Thanks, James. Are there any types of setups you’d like to see or see more of in general? I just wanted to say thank you for saharing not only your amazing work, but your knoledge too. Very generous from you. Keep up your inspiring work and this great blog. I’ll be returning on a regular basis.